Solar Mulberry Integra Size 2 from Sling Spot is in stock now! 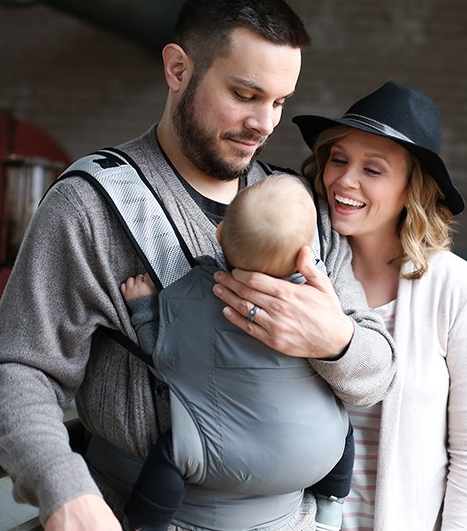 The Integra Baby Carrier is a brand-new carrier brought to you by an award-winning team. Lightweight, dual adjust straps (which are a game-changer! ), padded shoulders, a simple headrest on the sleep hood and a handy storage loop for the accessory strap, this is a great option for those who love simple, stylish comfort. Solar Mulberry Integra, Incredibly light weight carrier with sun-protective fabric. A fabulous addition to your hand luggage for trips away to warmer climates. Simple, stylish, comfortable. Good weight distribution without bulky padding, birth to toddler size! Designed by Sarah Sadler, the Integra Baby is the must have essential for the style conscious parent. Sarah has worked in the baby carrying industry for over 11 years and is the longest practising Babywearing Consultant in the UK. Together with her team of qualified babywearing consultants she has worked hard to bring you the Integra Baby Carrier. We expect it to become beloved! Check out our other stock of Integras here! sleek one-piece design incorporating a large sun/sleeping hood that fastens with small buckles to the shoulder straps to keep baby shaded or support a sleeping head. shorter straps are 2 inches shorter on the padded section of the shoulder strap to make it easier for those with smaller frames to fully tighten the straps. Here is a photo tutorial for how to put the Integra on in a front carry. Click on the photo to see it. Have a look at all our how-to videos here! Where possible spot clean your Integra with a soft cloth and warm water. When necessary you can machine wash your Integra on a delicate cycle at 30 degrees or less. Do not tumble dry, iron or bleach your Integra. Never use fabric softener or bleach products – or detergents which include them. We recommend using an ecological laundry liquid. Where possible, remove the buckles or clip them together before washing. Harris Tweed™ is 100% wool. The wool contains lanolin which gives it unique qualities. Harris Tweed™ repels dirt and moisture and will require less laundering. Repeated washing will, over time, remove the lanolin from the Harris Tweed™. It is not possible to relanolise, therefore we recommend that you only wash when needed and spot clean where possible to retain these special features. Store your Integra away from children and pets. The Integra can be folded and will fit inside most handbags or rucksacks. The accessory strap can be clipped around the carrier for easy storage or from the loop on the waist band. Regularly check your Integra for signs of wear and tear or accidental damage before each use. If you find any signs of damage do not use your Integra and contact us for advice.